Theory of Constraints is a management philosophy introduced by Eliyahu M.Goldratt in 1984 in his book “The Goal”. ToC is a concept of managing the constraints involved in any operations/business for maximizing the output of operations/goals of a business. The concept of ToC is used in fields like Operations management, Supply chain management, Project management, financial services, Defense and Government services and many other fields. So, it is an important concept that managers and quality professionals have to use in their profession. To understand the concept of ToC, we need to understand the following measures: Throughput, Operational expense, Inventory. Throughput: It is the rate at which the business generates money through sales. A constraint is anything that prevents the system from achieving its goal (i.e. : Achieving maximum throughput). Any system has at least one constraint which it has to tackle and survive in business. Constraints should not be confused with short term interruptions like breakdown, employee absenteeism etc. A constraint is a roadblock that prevents the process from achieving the throughput even when nothing goes wrong. Constraints can be external or internal. External constraints are when the system can produce more than what the market demands. In such a case, organization should create demand for the product in market. Internal constraint is when the system delivers less than the market demand. So, the organization should focus on discovering and removing or reducing the impact of it on throughput. Physical Constraint: Availability of materials, lack of physical space is some of the examples of physical constraint. Equipment Constraint: Availability of equipment, working hours of a machinery, efficiency and maintenance requirement are some of equipment constraint. People Constraint: Availability of skilled manpower and high manpower cost are some examples of People constraint. Policy Constraint: The policies and processes set by the organization may sometimes hinder or act against the throughput maximization. Identify the constraints influencing Throughput: Identify the current constraint which is a single step in the entire process flow that limits the rate of achieving goal. Exploit & Explore the constraints to maximize the Throughput: Brainstorm and identify quick improvement steps that will help the system to keep running without any stoppages due to the constraint. Subordinate all the other steps in the process to the above decision (Step 2): Modify and make changes to the upstream and downstream processes to be aligned with the pace of the constraint. Elevate the system’s constraints: Look at opportunities of eliminating the constraint from the value flow. One should keep finding ways and means until a constraint is broken. 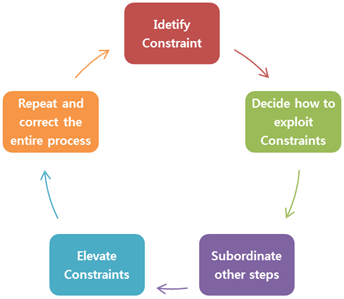 Repeat the entire process: The process of constraint management is a continuous process. Constraints keep changing and varying as the business changes. Therefore one should continuously keep managing and optimizing the constraints. Drum-Buffer-Rope (DBR) is the process of synchronizing operations to the constraint while minimizing work-in-process. The constraint of the process is called the “Drum”. It is usually the slowest step in the process. The speed at which the drum runs sets the “beat” for the process. The “Rope” is a pull signal initiated by the constraint to signify that a certain amount of inventory has been used and needs to be replenished. The role of the rope is to optimize throughput without accumulating excess inventory.